... views of the ocean [from the rear, the front featured in almost all of the pictures available faces the street] along with a private pool and a unique and romantic interior the house is owned by Octavio Ocampo, a well known local artist, and is available to rent. Quite a stunning location for a beach vacation don't you think? 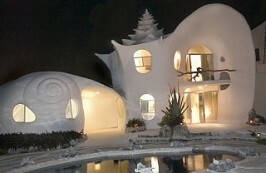 The vacation rental website Casa Caracol offers details, prices and contact information. Featuring 2 king size bedrooms, 2 full baths and a half bath along with your private pool the property is offered at $1500/Week or $215/Day from the time of writing [July 5th 2011] through the end of 2011. Hopefully my wife will not see this. 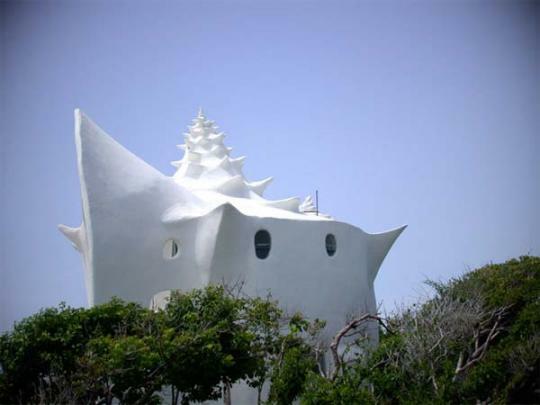 "The Shell house is the most original house in Isla Mujeres or maybe in the world. One of the most sensual houses you will ever enjoy. Experience the beauty of the Caribbean Ocean with 180 degrees of ocean views. 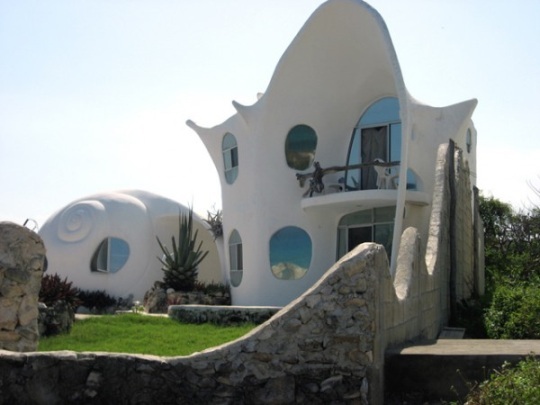 Have you ever imagined living inside a sea shell? Taken a bath under a shell fountain. The pleasure of waking with the ocean’s murmur and the gentle caress of the ocean’s breeze. Dip in your own private pool. Reach with just a few steps amazing cliffs and beaches that appear and disappeared with the tides, where the ocean shares incredible gifts, amazing shells and corals you'll find along the sea. Awaken to the most incredible sunrises where you need to pinch yourself to make sure you are not still dreaming. A sky full of stars like you have never experience, Moon rises that you have seen only in your dreams." 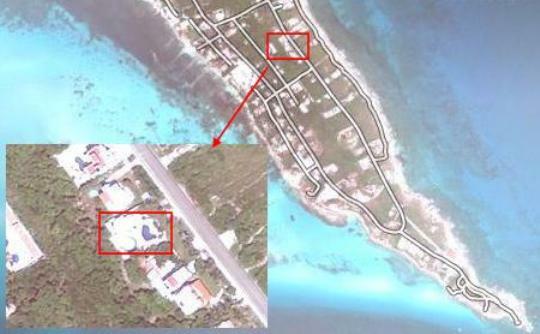 Having visited Isla Mujeres some years ago [and regretting never having seen this amazing home] we don't think that they are exaggerating all that much. It is a captivating and breathtaking Caribbean hideaway. There are reviews of the property as a rental here. Not surprisingly they are almost all very favorable. The fame of the "Conch House" has been far reaching. It features on many websites and blogs and was the subject of an article in the London Telegraph, a highly reputable British newspaper back in 2009. It was a little tricky finding the home on Google maps. There was no address that we could find and there were many images marked on Google maps relating to the "Conch House" but in the wrong location. We finally tracked it down though - the screenshots and the embedded map below will help you find it if you want to take a look for yourself.